The Trump Administration’s proposed Supplemental Nutrition Assistance Program (SNAP) rule would time limit food benefits for unemployed and underemployed people who can’t document sufficient weekly work hours. They would lose SNAP eligibility after three months. Anti-hunger advocates are urged to submit a comment expressing their strong opposition to the proposed rule during the 60-day public comment period that ends on April 2, 2019. 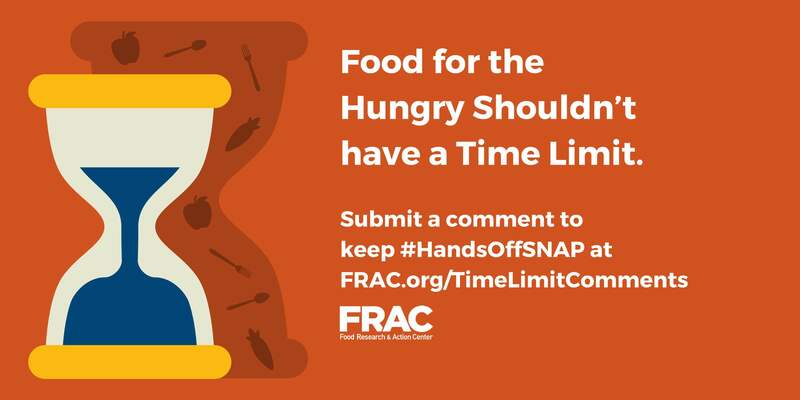 Currently, 30 counties and all tribal areas in Minnesota have waivers that exempt people from the time limits in SNAP. These areas have higher unemployment rates and it can be hard to find jobs or enough work hours. In Minnesota, the rule change could impact as many as 4,500 people who live in these counties and tribal areas and are currently exempt from the three month time limit. We are asking you to submit comments on this proposed rule this week. FRAC has sample comments and talking points that you can use as a framework for your comments and we are available to help you craft your comments. Your comments don’t have to be long. A few quick paragraphs is all it takes. Do NOT copy-paste model comments. The federal government is reviewing all comments and are rejecting comments that use a lot of the same words and phrases. Use your own words and experience to share your story. Are you on SNAP? Do you know people who use the program? How would time limits impact you or the people you serve? The deadline for comments is April 2, 2019. Let us know if you need help crafting your comments. Already submitted comments? Let us know!